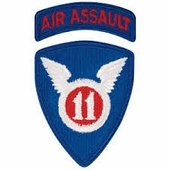 The Eleventh Air Assault Division patch was worn from 1 February 1962 to 1 July 1965. The Eleveneth Air Assault Division was activated in February 1963 at Fort Benning, Georgia. On 1 July 1965, the Eleventh Air Assault Division was merged itno the First Cavalry Division (Air Mobile). The Cavalry colors were flown to Fort Benning, Georgia and a swap of flags was made. The design of the shoulder sleeve patch was taken from that of the Eleventh Airborne Division. Our 11th Air Assault Army Patch is a regulation, full color, embroidered military patch. This is the same patch that is supplied to the U.S. Army, Army National Guard, Army Reserve units, and sold in the Army Post Exchanges. This patch would be a great gift idea and a wonderful addition to your patch collection.